When done properly, powder coating provides an incredibly durable coating for most metal items, with significant environmental benefits. At Pelletier's, we are equipped to powder coat nearly any item in a wide range of colors and finishes. 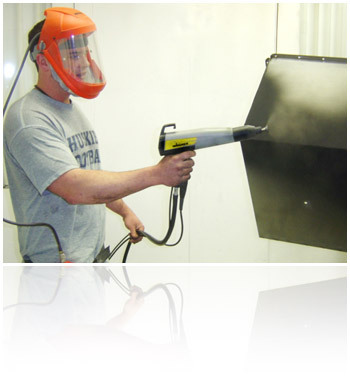 Powder coating is an advanced method of applying very finely ground particles of pigment and resin to a surface. As the powder leaves the spray gun, it is charged with static electricity. Because the powder particles are electrostatically charged, an ion cloud is created. The powder passes through this cloud and picks up a negative charge. The powder will remain attached to the parts as long as some of the electrostatic charge remains on the powder. The electrically charged powder particles adhere and bond to the similarly grounded product surface, fusing into a smooth coating before final curing. The coated items are then placed in an oven and heated to temperatures ranging up to 425 degrees fahrenheit. The baking process prevents powder coating from being applied to heat-sensitive materials, such as plastic or wood. Simply put, the process is economical, efficient and environmentally responsible. The finish will be void of drips, runs, sags or "orange peel". The process ensures superior edge coverage and is incredibly resistant to fading, chipping and rusting. Please email us or call (807) 623-4532 (Toll Free: 1 (888) 789-1040) for more information or to arrange an appointment. Steel rims. Aluminum rims. Magnesium rims. Car parts. Bike parts. Boat parts. Extrusions. Milled parts. Steel doors. Computer components. Lighting fixtures... If it's metal, we can coat it. Pelletier's Powder Coating is proud to be Northwestern Ontario's leader in environmentally responsible automotive maintenance and repair solutions. It's what matters most.